When a big project managed by a large group of people comes together so beautifully, so rhythmically, you can look back on many reasons. 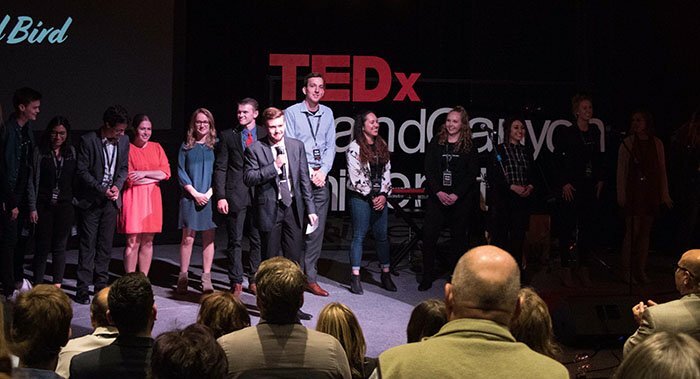 The student team that organized and ran TEDxGrandCanyonUniversity 2018, led by President Dom Pachuilo (front), gets a standing ovation from the audience afterward. Coincidences that could only be by the grace of God. 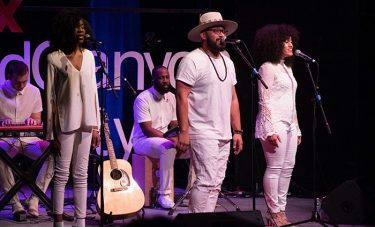 But when you add in the fact that a group of 40 Grand Canyon University students are putting on TEDx events by themselves, it’s no wonder that there was a sense of awe Friday night at Ethington Theatre. 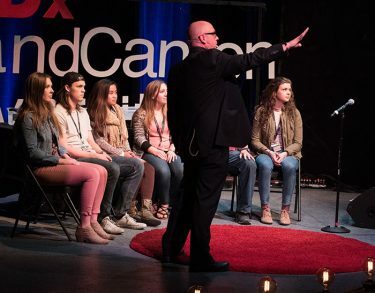 The decision appeared unanimous: The students hit it out of the park in their second try at the independently managed event authorized by TED (Technology, Entertainment and Design), a non-profit organization with a mission to spread ideas. 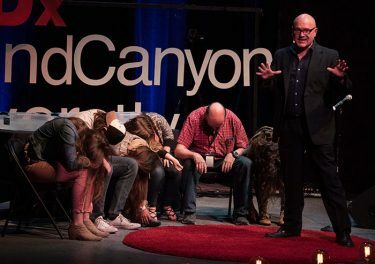 The featured speakers and performers, all of them accustomed to working with much more seasoned event planners, certainly gave TEDxGrandCanyonUniversity 2018 a huge thumbs-up. Said Jeff Golner, “It almost reminded me of my own college days. Would I have been able to do something like this? I’m not sure.” That comes from a man who has been doing marketing and event production for his whole career. … and then pushed their heads down to demonstrate how hypnosis can work. The details included having a student liaison with each speaker/performer Friday, just to make sure they had everything they needed, and praying together with the speakers and performers. The students tried to think of everything, but their featured guests liked something else about them just as much. 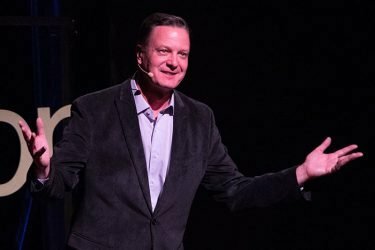 Having a student-run event played perfectly with Orr’s talk, “Millennial Leadership: The Key to Your Organization’s Success.” He urged his listeners to give younger employees leadership roles and help them grow, and afterward he was thrilled that GCU had done just that with TEDx. Rachael Mann’s talk, “The Martians in Your Classroom,” also fit right in with what the students accomplished. 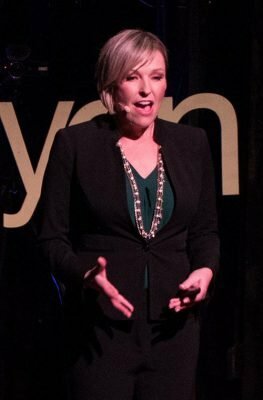 She is an advocate for new teaching methods and systems to reflect how fast the world is changing, and a student-run TEDx certainly is a change from what the world has known. It just kept coming together like that. The decision to move the event to Ethington this year resulted in a packed audience in an intimate setting. Having fewer speakers than the first year also proved wise, and experienced emcee Nathan Havey added a professional touch. “It was different – different enough that it was hard to compare,” said Paul Waterman, the Colangelo College of Business (CCOB) instructor who serves as an advisor to the TEDx student team but lets them make all decisions. Mann pointed out that there was a 66-year gap between the first airplane flight and the moon landing but only another 29 years before the international space station was launched – and a trip to Mars isn’t far away. “When man landed on the moon, computers were less powerful than the wristwatch on my arm,” she said. Pyle, like Flores, had to battle his emotions as he painted a word picture of what he felt during his visit to the Auschwitz concentration camp. 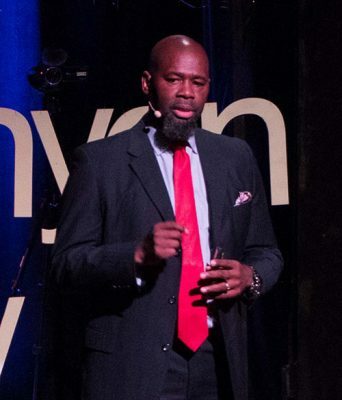 It inspired him to find a copy of holocaust survivor Viktor Frankl’s book, “Man’s Search for Meaning,” and it made him take a new look at what defines a successful business – some seemingly reputable companies unwittingly signed contracts with the Nazis in the name of profit-seeking. Golner told of how going to Phoenix Suns games as a child got him focused on all the things that go into an event and led him to eventually produce almost 700 Arizona Diamondbacks games. His new goal is combining STEM (science, technology, engineering and math) education with sports. Orr produced two interesting survey results to demonstrate the similarities and differences between generations: Baby Boomers held an average of 7.3 jobs between ages 18 and 28, while millennials, widely considered far more flighty, were at 7.2 in that span. But when asked how long they would stick with a job if they didn’t think their leadership role was growing, Baby Boomers said 10 years, Generation Xers said five years and millennials said one to two years. The night closed with a performance by SAMxSOLUxSANNA, a five-person group that performed a skillful interpretation of Maya Angelou’s “The Caged Bird” even though they started working on it only a month ago. They got a standing ovation. 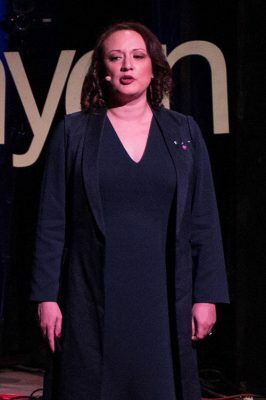 The speakers got another taste of millennial entrepreneurship after the show when each received a special gift from Elroi & Men, the bowtie business started by 2017 GCU graduate Andrea Northup to help the Lakota American Indians in South Dakota by giving them jobs. She gave an impromptu talk about her mission that was as polished as any formal presentation. There even was coincidence in how Northup became involved. She does her sewing in the Lazarus Lab, where CCOB students gather to brainstorm ideas for their budding startups. The TEDx organizers just happened to be there around the same times, and one thing led to another. It took a similar moment of fate for Dominic Pachuilo to be this year’s president of the student team. 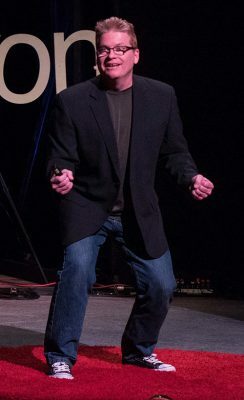 A year ago, he still was recovering from the physical and mental effects of his battle with cancer – yes, cancer – when he saw a poster soliciting TEDx volunteers. “It all started with taking a chance,” he said. That made it all the more emotional late Friday night as he sat on a sofa in the Ethington lobby and tried to take it all in, not long after the students came onstage and got their own standing ovation from the audience. There’s even a backstory behind Pachuilo’s masterful handling of his onstage duties during the show despite his relative lack of experience. His mother owns a teleprompter company, and he regularly got to witness Fortune 500 events. She drilled him hard to polish his public-speaking ability by avoiding “uh” and other useless pauses. The students are hardly done. Now begins the process of electing new directors for next year’s show, necessary because of the many current directors will graduate in April. They won’t have much time to rest on their laurels – but they will continue to review what caused whatever mistakes they made. And that’s how it all comes together. Only in this case, they succeeded fast – and that’s no coincidence.